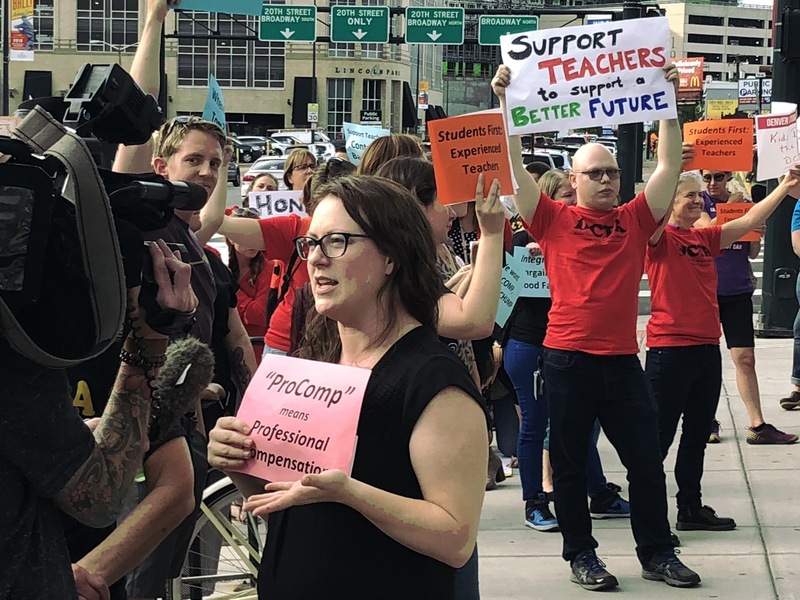 An energized and large crowd of dedicated teachers rallied outside the DPS Administration Building last night, anxious to take their urgent message about inadequate pay to the DPS School Board meeting and Superintendent Tom Boasberg. The group got their chance to speak to board members during public comments, but first took time to generate enthusiasm and support by protesting on Lincoln St. as the meeting got underway. “Isn’t this great! Isn’t this amazing!” said DCTA President Henry Roman as one-by-one, teachers stood to address the crowd and passersby. Roman had just finished giving an interview to Telemundo, just one of the Denver news outlets in attendance to capture the evening’s events. Elsewhere on the sidewalk, teachers could be seen responding to questions from reporters while holding up their signs for the cameras. In addition, traffic on nearby streets produced horn honks with every pass, in response to signs from the chanting protestors. Inside the building, the horns, applause and shouts of the protest could be heard clearly as the board meeting’s agenda progressed. Finally, toward the close of the meeting, DCTA teachers entered the room to speak directly to the board and Tom. At the top of their requests: That Boasberg and the district start to actually bargain with teachers in good faith. The teachers that addressed the Board repeated much of the passionate appeals made at Wednesday’s Bargaining Session, when Boasberg was absent. In his testimony, Edwards told the Board how frustrating it has been for him to gauge what his income will be during the year, and how it is nearly impossible for him to determine what he might make in coming years. He pleaded with the Board to commit Boasberg’s attendance to all negotiations, saying his future (and the future of his students) depends on it. Rebecka Hendricks, who teaches in a “hard-to-staff” position, lamented her inability to “live like an adult,” telling the Board she has gone without common life phases others her age take for granted. As a result, Hendricks said she’s considering leaving the profession she loves, and she knows many other teachers who feel the same way. “Students deserve to have a teacher who loves their job,” she said. Boasberg sat stone-faced and silent throughout the educator comments, offering no response or even acknowledgement that what he was hearing was important for the district’s future or student’s needs. First-year DPS teacher Matthew Placido lamented the fact that while he loves his students, he faces an uncertain future. During his first year in the district, Placido said he had to use all of his personal savings in order to survive due to his inadequate salary and Denver’s increasing cost of living. He’s already certain he’ll have to take a second job next year, and he’s worried that it might impact his students. Placido expressed to the board how difficult it will be for him to stay in the district if he wants to have a secure future. What’s more, he said, he’ll be taking the information and insight he’s learned through district professional development resources to another district. At the end of the teacher’s comments, there was no commitment from Boasberg that he would attend future negotiations, and he gave no indication he had taken the feedback seriously.